You can knock a small opening in the side of a clay pot, or even stack a few bricks to make a small shelter. 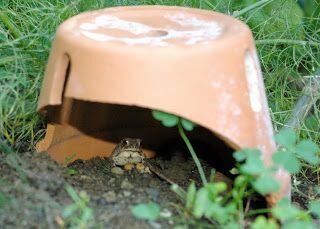 Toads will be attracted to the shelter, use it during the day and claim it as their territory coming back year after year. Each night one toad can eat up to 100 slugs, grubs, grasshoppers, tomato beetles, cutworms...anything you don't want eating your garden. The tadpoles also eat mosquito larvae!